A bat colony living in Combe Down stone mines in Somerset is to get a living signpost for when the bats go hunting. Under the Batscapes project, a group of volunteers will meet at Pennsylvania Farm near Newton St Loe to build a new hedgerow for horseshoe bats to follow. "Hedges and tree lines act as vital bat highways for the bats flying out to hunt their insect prey," said Dan Merrett of Batscape. All bats follow paths, but horseshoe bats are especially dependent on them. 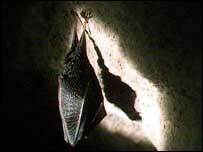 In 2001 the rare greater horseshoe bats living in the stone mines were radio tracked to see which areas were important for them to hunt over. The study showed that one of the favoured flight routes was from Combe Down through Englishcombe towards the largely Duchy-owned land south west of Bath. As part of the Batscapes Project Somerset farmers are receiving free bat friendly management and grant information. As a result Pennsylvania Farm has received funding to replant gaps in hedgerows and plant entire new ones, while the Batscapes Project arranged for further help in the form of the BTCV led party of volunteers. Batscapes is a three year project covering Bath & North East Somerset and South Gloucestershire districts and supported by the Heritage Lottery Fund, English Nature, the Duchy of Cornwall and a variety of other partners.